We’re hitting the road again! A series of meetings will be held in concert in Orlando February 6-8, 2018 including the ACMA and Lead OAP meeting, the Army Acquisition Workforce (AAW) Human Capital Strategic Plan (HCSP) Council, and the Army Acquisition Functional Leaders/Army Acquisition Functional Advisors (AAFL/AAFA) Summit (the first of its kind). These meetings are a way for the Army DACM Office to connect face-to-face with our many partners and leaders at tactical, operational, and strategic levels. As always, we hope to hear from the field and collaborate best practices between commands/organizations. Coming soon! We’re working hard on the January 2018 Army DACM Newsletter to bring you a fresh new perspective for a new year. If you missed first quarter edition, check out our October Newsletter with lots of great references you’ll want to keep around. Our new website is on its way! We’re getting ready to launch a new website, taking careful consideration what you, the AAW, has told us you’d like to see and to make it easier to find what you’re looking for. We expect the site to launch late January (after our final round of testing) and are so excited to show you what we’ve been working on! Acquisition Training, Education & Leader Development Opportunities. Turn those innovative broadening and training ideas into a reality. The FY19 Defense Acquisition Workforce Development Fund (DAWDF) data call for funding requests from the Army DACM Office is open from February 1 to May 15, 2018. DAWDF allows organizations to design quality initiatives to recruit, develop and retain the Army Acquisition Workforce (AAW) of the future. 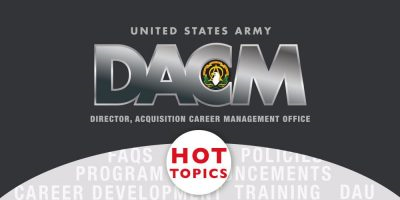 As part of the AAW Human Capital Strategic Plan and the talent management program, organizations are encouraged to develop broadening assignments that gain experience in science and technology, test and evaluation, material development, and sustainment to develop our future acquisition leaders. Talk with your command DAWDF POCs for more information. There is a change to the 2018-2019 offering of the DAU Senior Service College Fellowship (DAU-SSCF), currently open for applications from December 1 to March 30, 2018. DAU-SSCF will NOT be offered at Picatinny for our 2018-2019 offering but, instead, will offer the Picatinny location for the 2019-2020 application. DAU-SSC program announcement can be found at: https://asc.army.mil/web/career-development/programs/defense-acquisition-university-senior-service-college/. Need more help? Want to know more about a program? OAPs or AAW members can submit a CAMP Help Request ticket and we’ll be happy to get you there.